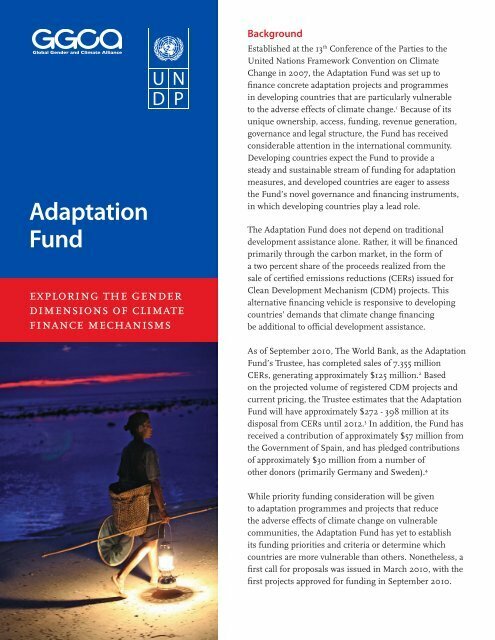 Adaptation Fund exploring the gender dimensions of climate finance mechanisms Background Established at the 13 th Conference of the Parties to the United Nations Framework Convention on Climate Change in 2007, the Adaptation Fund was set up to finance concrete adaptation projects and programmes in developing countries that are particularly vulnerable to the adverse effects of climate change.  1 Because of its unique ownership, access, funding, revenue generation, governance and legal structure, the Fund has received considerable attention in the international community. Developing countries expect the Fund to provide a steady and sustainable stream of funding for adaptation measures, and developed countries are eager to assess the Fund’s novel governance and financing instruments, in which developing countries play a lead role. The Adaptation Fund does not depend on traditional development assistance alone. Rather, it will be financed primarily through the carbon market, in the form of a two percent share of the proceeds realized from the sale of certified emissions reductions (CERs) issued for Clean Development Mechanism (CDM) projects. This alternative financing vehicle is responsive to developing countries’ demands that climate change financing be additional to official development assistance. As of September 2010, The World Bank, as the Adaptation Fund’s Trustee, has completed sales of 7.355 million CERs, generating approximately $125 million. 2 Based on the projected volume of registered CDM projects and current pricing, the Trustee estimates that the Adaptation Fund will have approximately $272 - 398 million at its disposal from CERs until 2012. 3 In addition, the Fund has received a contribution of approximately $57 million from the Government of Spain, and has pledged contributions of approximately $30 million from a number of other donors (primarily Germany and Sweden). 4 While priority funding consideration will be given to adaptation programmes and projects that reduce the adverse effects of climate change on vulnerable communities, the Adaptation Fund has yet to establish its funding priorities and criteria or determine which countries are more vulnerable than others. Nonetheless, a first call for proposals was issued in March 2010, with the first projects approved for funding in September 2010.